The 2012 Chrysler 300 and 2012 Dodge Charger have achieved 5-star safety ratings from the National Highway Traffic Safety Administration (NHTSA). The 5-star rating is the highest rating for safety by the Administration and measures vehicle safety performance in three categories, including front and side crashes as well as for rollover. Both Chrysler 300 and Dodge Charger achieved an overall 5-star vehicle safety score. The rating is a combination of frontal, side pole and barrier performance with the static stability factor accounting for the rollover rating. Both Chrysler 300 and Dodge Charger also achieved high marks in rollover testing with a 4-star rating. The advanced Adaptive Cruise Control maintains a set distance between vehicles when the cruise control is engaged. Other safety and security features on the Chrysler 300 and Dodge Charger include standard electronic stability control and available blind-spot monitoring. Earlier this year, the Chrysler 300 and Dodge Charger were named a “Top Safety Pick” by the Insurance Institute for Highway Safety. Both the Chrysler 300 and Dodge Charger are equipped with more than 65 safety and security features, including segment-exclusive Ready Alert Braking and Rain Brake Support features to support overall vehicle handling and performance under all weather and pavement conditions. 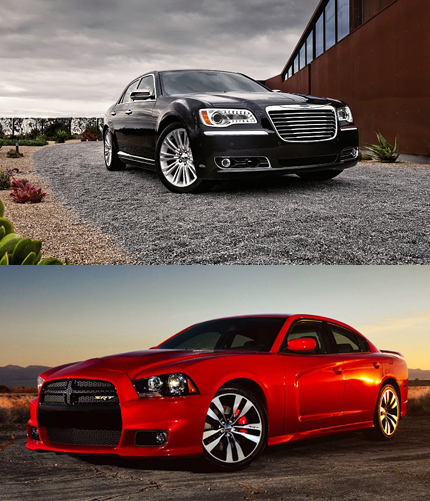 Safety ratings are just part of the story with both the 2012 Chrysler 300 and 2012 Dodge Charger. Both vehicles also are equipped with a new 8speed automatic transmission, a first by a domestic automaker. Combined with the award-winning 292 horsepower Pentastar V-6 engine, both vehicles achieve a Best-in-Class EPA-rated 31 miles-per-gallon on the highway. The eight-speed transmission also is available for all-wheel-drive models. Both Chrysler 300 and Dodge Charger also include state-of-the-art Uconnect® navigation and entertainment systems. The Garmin navigation system found in both vehicles recently was recognized by J.D. Power as the top consumer choice for in-vehicle navigation, additionally, Dodge Charger recently received the Breakthrough Technology Award for 2012 from Edmunds.com for the Uconnect driver information system. The award recognizes a vehicle that sets the standard for intuitive, practical and affordable automotive technology.